Perfect Vanilla Sheet Cake Recipe (with VIDEO!) — Pip and Ebby - easy, delicious recipes! This Vanilla Sheet Cake recipe turns out perfectly every single time. The cake is perfectly moist, flavorful and fluffy and topped with Vanilla Buttercream Frosting, making it the perfect party dessert! One of my 2018 recipe obsessions was cake. I lived and breathed cake ideas for half of the year. Strawberry Bundt Cake, Chocolate Raspberry Cake and Lemon Blueberry Layer Cake were all born of that obsession. When I started dreaming about flavors and colors that would go into a certain cake creation, I always went big and bold. Sometimes, though, simple is best in the world of cakes, like those times when a basic sheet cake is needed for a birthday or retirement or graduation or summer party. This vanilla sheet cake turns out perfectly every single time and I love the consistency of that. It is dependable, moist, flavorful and it bakes totally evenly throughout, from corners straight through to the very center. Bookmark this recipe pronto because I promise you’ll be coming back to it for about 12 different occasions throughout the year, whenever an easy cake needs to be made. Watch this quick video to see how easy it is to make Vanilla Sheet Cake! Enjoy the step-by-step video tutorial we have created for this recipe! Our goal is to make your time in the kitchen as easy as possible and to ensure that your version of this recipe is a success. See our full collection of cooking and baking videos on Youtube! Follow these easy steps to make the most perfect vanilla sheet cake! Preheat oven to 350 degrees F. Coat a 11x16 pan with cooking spray and set aside. Using a stand mixer fitted with the paddle attachment (or a large mixing bowl with a hand mixer), combine the butter, sugar, eggs and vanilla and beat until combined. In a separate bowl, combine the flour, baking powder and salt. Mix well. Gradually add to the butter mixture and beat on medium-low speed until just combined. Add the milk and mix until just combined. Pour the batter into the prepared pan, spreading in an even layer. Bake in the preheated oven for 20 minutes, or until a toothpick inserted into the center comes out clean. Let cool. Spread Vanilla Buttercream Frosting over the top in an even layer and top with sprinkles, if desired. Cut into squares and serve! My sheet cakes turn out perfectly when I use an 11x16 half sheet pan. If you do not have a half sheet pan, a 10.5x15.5 jelly roll pan will work great, too. Any time you change pan sizes, be vigilant about looking for signs that the cake is done. Look for a uniformly golden brown surface, with no gooey centers. If you think a cake looks like it is done baking, stick a toothpick into its center. When it comes out clean (no crumbs stick to it), it is baked evenly and done baking! 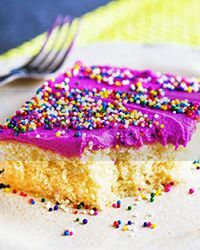 One batch of Vanilla Buttercream Frosting provides the absolute perfect amount and also the perfect flavor when spread over this sheet cake. Add food coloring to match your occasion and to add a touch of fun! Or go wild with your frosting and add a flavor twist. Turn it into Caramel Buttercream or Lemon Buttercream or Chocolate Cream Cheese Frosting! Whichever route you go, don’t forget the sprinkles! Thanks for being here, friends! Enjoy this delicious, easy sheet cake recipe at your next celebration! Bake in the preheated oven for 20 minutes, or until a toothpick inserted into the center comes out clean. Let cool. Spread frosting over the top in an even layer and top with sprinkles, if desired. Cut into squares and serve!